Augsburg University celebrated the Grand Opening of the Norman and Evangeline Hagfors Center for Science, Business and Religion January 27, 2018, creating a visually inviting gateway to the urban Minneapolis campus. 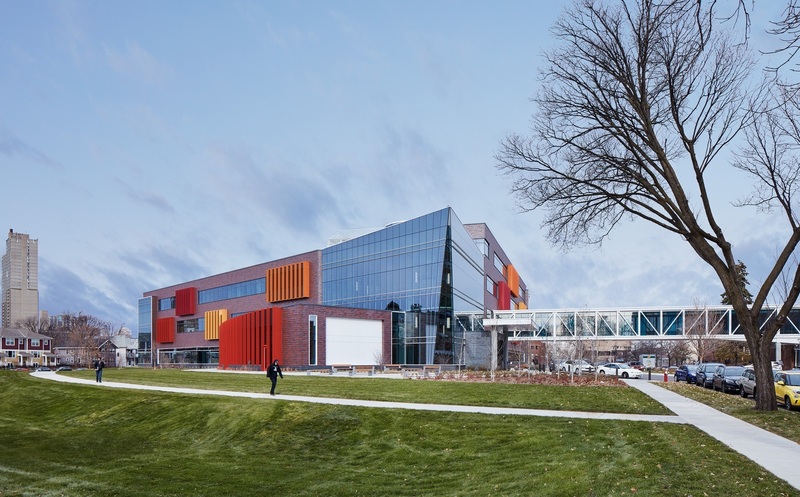 Designed to foster interdisciplinary learning and connect the University to the community, Hagfors Center embodies Augsburg’s commitment to student learning, urban placemaking, and thoughtful stewardship, according to University leadership. The 139,000-square-foot, four-story academic building integrates classroom, laboratory and research facilities for eight departments (biology, business, chemistry, computer science, math, physics, psychology, and religion) serving more than 2,500 students. Classrooms and labs flexibly reconfigure to support active, experiential learning and other teaching and learning formats. Casual spaces foster interdisciplinary and collaborative learning in common areas while exterior spaces—the south lawn, east terraces, community gardens—create outdoor teaching environments and opportunities for community engagement. The location opens green space on campus. Landscaping includes a graywater pond, community garden, rain garden, community seating areas, and circular drop-off. Plans to raze the adjacent Science Hall will extend the campus’s central green space through the heart of campus. Additionally, Hagfors Center welcomes the neighborhood with an “open arms” design facing the adjacent residential community and embracing the community gardens. Architecturally, the brick building features a glass-enclosed entrance commons and color-coated bay windows that identify different academic departments. Interior spaces are built on a modular framework that flexibly support a variety of uses and adaptability for long-term needs. The commons area includes gathering spaces, soaring paneled wall made of American elm wood, and handwritten musical notations of Martin Luther’s “A Mighty Fortress is our God” etched on the glass windows. Serving as an educational tool in sustainability and environmental design, Hagfors Center includes energy-efficient systems, recycled materials, low VOC emitting components, high-tech controllable lighting, low-flow plumbing fixtures, storm-water control, and partial green roof. The building is targeting LEED Silver certification. In many ways, working with Augsburg University was an ideal project for the design team. “Augsburg is one of the most thoughtful, reflective partners that we’ve ever had,” said William Blanski, FAIA, LEED AP, Vice President and Design Principal with HGA. For more information, visit Augsburg University.